Like many other national parks, Rocky Mountain National Park is known for its spectacular scenery. Visitors can see snow-capped mountains, 77 of these reaching elevations of 12,000 feet or higher, and lush valleys. What makes this park different is that it’s the highest national park in the country, and it has multiple ecosystems. 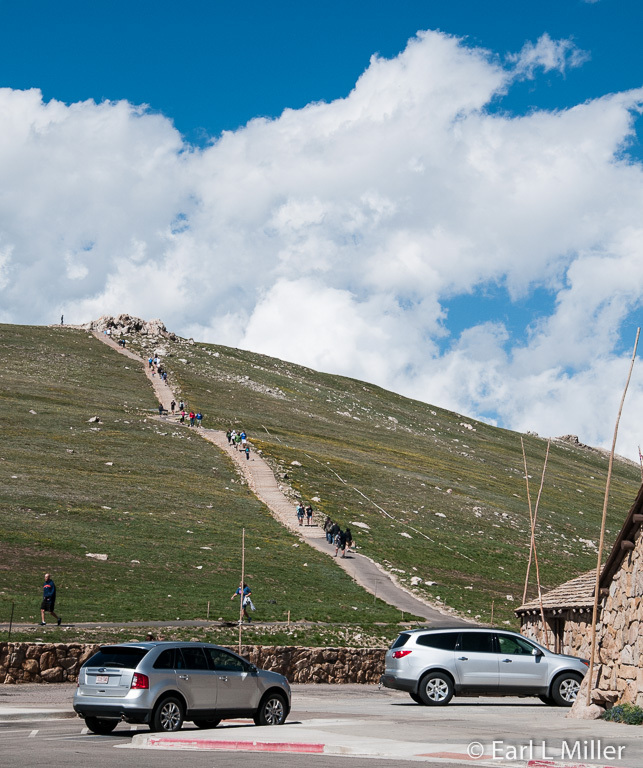 While traveling the 48-miles on Trail Ridge Road, you’ll experience four different environments as you drive from 8, 940 feet to 12,110 feet. The drive starts in the montane forests of aspen and ponderosa pine then enters the subalpine forests of spruce and fir. At treeline, stunted, wind-blown trees exist, before you reach the alpine tundra that's similar to an arctic environment. Eleven miles of Trail Ridge Road are above treeline. Streams and lakes representative of the riparian ecosystem run through all the areas. The road is one of ten of America's Byways and a national designated All American Road. 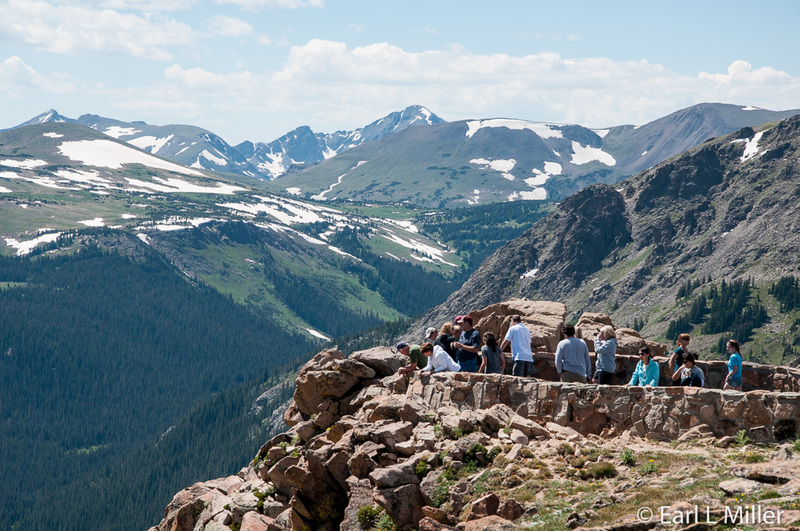 It is one of the major reasons why Rocky Mountain National Park draws so many visitors. On Route 34, near Estes Park, before entering the park, feel free to stop at Falls River Visitor Center. Its displays concentrate on wildlife and wildlife management. Park rangers, present at this site, like all other visitor centers, willingly answer questions and help you plan your day. It’s also a good place to purchase books on the park. I found the booklet, Guide to Trail Ridge Road, which sells for $2.00, a wise purchase. It explained what we saw at each overlook. A giftshop is adjacent to the center as is the Trailhead Restaurant specializing in game cuisine. 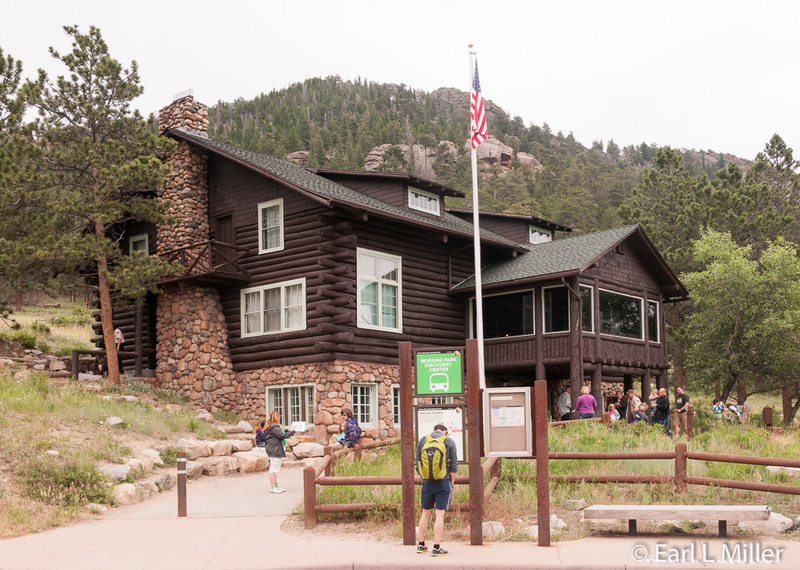 Another visitor center, located close to Estes Park, is Beaver Meadows Visitor Center, lying outside park boundaries. You can speak to a park ranger, browse through the bookstore for much of the same books, and watch the 23-minute movie “Spirit of the Mountains” in a theater downstairs. While downstairs, take a few minutes to examine the topographic model of the park. Electric lights highlight the park’s roads, campgrounds, and five visitor centers. This display also gives a brief explanation of the type of rocks you will see - granite, schist, and metamorphic. If you are staying at Grand Lake, you might want to stop at Kawuneeche Visitor Center. It also has a bookstore, rangers, and the same movie as Beaver Meadows as well as a topographic map. The park movie shows footage of the scenery you will see and relates the park’s history. Paleo Indians, then the Utes, and finally the Arapahos discovered the area. Their trails are routes that park roads now follow. In 1803, the U.S. government acquired the land as part of the Louisiana Purchase. Rufus Sage, from Connecticut, composed in 1843 Scenes in the Rocky Mountains, the first written account of the area’s wonders. Sage had spent four years in the Rockies. The first settler was Joel Estes, for whom Estes Park was named. He was a Kentucky newspaperman who raised cattle. As the number of visitors grew, he converted his cabin into guest accommodations in 1867. By 1877, the Grand Lake area also attracted permanent settlers. In 1868, the explorer, John Wesley Powell, conquered Longs Peak’s summit, and in 1773, Anna Dickinson became the first woman to successfully make this climb. Her book, A Lady’s Life in the Rocky Mountains, attracted many visitors to the area. During the 1870's, loggers, miners, and ranchers came in droves to make the area home. Bear, deer, and elk were abundant. Commercial hunters delivered a weekly supply of three tons of assorted big game meat to settlers. By 1900, large game was almost gone from the park’s east side. They also hunted wolves. Even today, the bears and wolves have not recovered from this onslaught, although the elk have. Ranchers and farmers fought for water rights. They built canal systems to transfer water from the western slopes to the eastern plains. 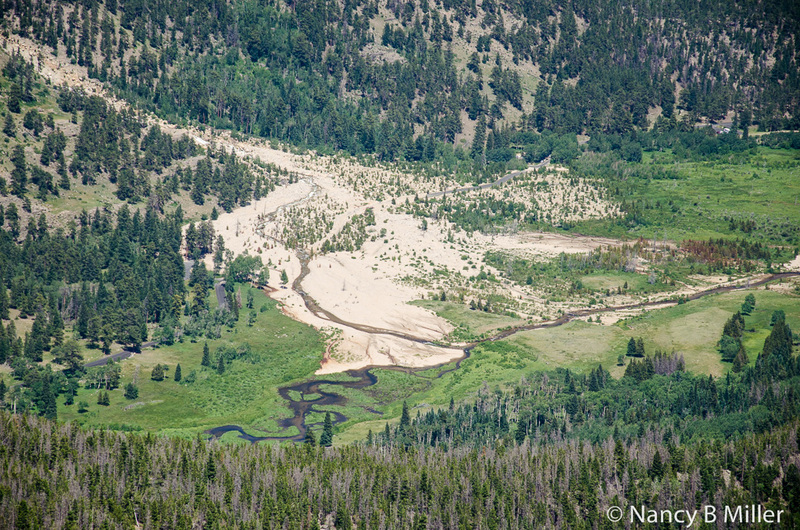 The Grand Ditch, in the Never Summer Range in the park, intercepted several stream tributaries of the Colorado River and diverted them to irrigate eastern plains crops. It was built between 1890 and 1911 in segments with human and horse labor. By 1904, the work crew included Mexicans and Japanese who were paid 22 cents an hour. The deduction for each meal was 25 cents.Using heavy machinery, the park constructed the final seven miles of the Grand Ditch to Baker Creek between 1935 and 1937. To get a glimpse of the remains of this ditch, stop at Tour Stop 11 on Trail Ridge Road. It resembles a road going up the mountain. You’ll find it at Fairview Curve. In 1903, F. O, Stanley, inventor of the Stanley Steamer, made his home in Estes Park. In 1909, he opened his elegant Stanley Hotel. Stephen King made this lodging famous in his book, The Shining. Stanley was mostly responsible for establishing the Estes Park Protective and Improvement Association which protected local wildflowers and wildlife and started improving roads and trails. Enos Mills, a naturalist, came to the area in 1884. He wrote several books about the area’s natural history. 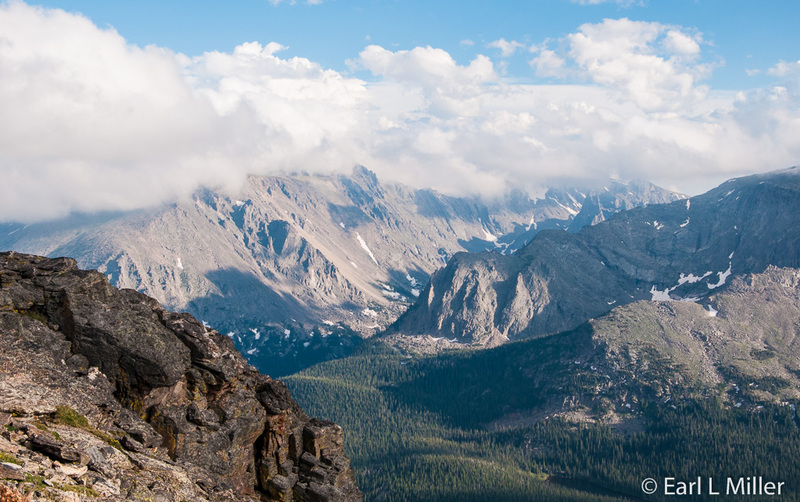 In 1909, he proposed that the Rockies become the nation’s tenth national park. He incessantly lobbied Congress suggesting a new park running from the Wyoming border south to Pikes Peak. While most civic leaders supported the idea, mining, logging, and agricultural interests opposed it. James G. Rogers, first president of the Colorado Mountain Club, suggested a compromise of a smaller park of 358.3 square miles. President Wilson, on January 26, 1915, declared the land Rocky Mountain National Park. It has since grown to 415 square miles. Two other visitor centers are found within the park. The Moraine Park Visitor Center, found on Bear Lake Road, about 2.5 miles southwest of U.S. 36, has displays on such topics as weather and geology. Learn about the kinds of rocks in the Rockies. One-half are due to igneous intrusions from deep in the earth from 1.6 billion to 28 million years ago. Read how the Rockies current appearance is due to glacial erosion and find out what animals lived in the Glacial Age besides the mammoth. My favorite displays were the dioramas on all four ecosystems found in the Rockies showing actual birds, mammals, and vegetation. For example, in the montane ecosystem, you find raccoons, Colorado chipmunks, and cottontail rabbits. In the alpine, you might notice a squirrel. This is also the visitor center which is very active in Junior Ranger programs. We saw a lot of children learning about beavers and checking out the signboard about carnivores and herbivores. The visitor center was once part of a guest ranch owned by Albert Sprague, a gold prospector, in 1875. The immediate area housed several lodge stores, summer cabins, and a post office. In the late 1950's, Sprague’s nephew purchased the ranch and built a golf course. In 1962, the national park bought the property and removed all buildings and the golf course except for the current visitor center. At tour stop 8 on Trail Ridge Road, at Fall River Pass, you will find the Alpine Visitor Center. A large gift shop and café are also at this location. 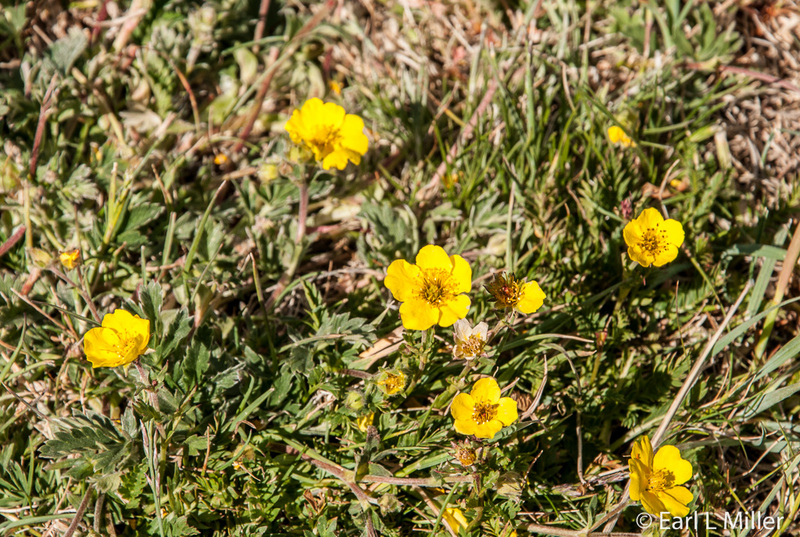 Besides rangers and a bookstore, this center has quality exhibits on understanding the Native Americans who lived here and photos of some of the park’s more than 100 species of alpine wildflowers. We learned the tundra covers nearly one-third of the park. We also read signboards about how the animals adjust to this alpine atmosphere. They do it by migration elks; hibernation, marmots sleep seven to eight months; and toleration, long-tailed weasels and ptarmigan change their coloration to white to be less evident to predators. With 12 tourist stops on the Trail Ridge Road, you will probably want to pull over at all of them because of the great opportunities for photography. If you do, plan on a minimum of three to four hours and realize weather conditions vary greatly. We tried driving the route in the morning but had to turn around at tour stop 4, Rainbow Curve. Severe fog eliminated seeing anything more than two cars in front of us. We tried it again in the afternoon and had sunshine with a few fluffy clouds. That was perfect for photography. At tour stop 4, the Rainbow Curve, look for the large, light-colored alluvial fan of rubble on the north side. Floodwaters deposited this debris in a matter of hours when a man-made earthen dam at Lawn Lake gave way July 15, 1982. The waters scoured the stream valley for five miles displacing boulders, gravel, and sand onto Horseshoe Park’s floor in a rocky layer 44 feet deep. At tour stop 5, Forest Canyon Overlook, we took a five-minute walk to see a panorama of Forest Canyon. The valley has been eroded into the typical glacial U-formation. With even a short walk, you will be quickly reminded that the air is much thinner at these high altitudes (11,716 feet at this location), and it is easy to get short of breath. 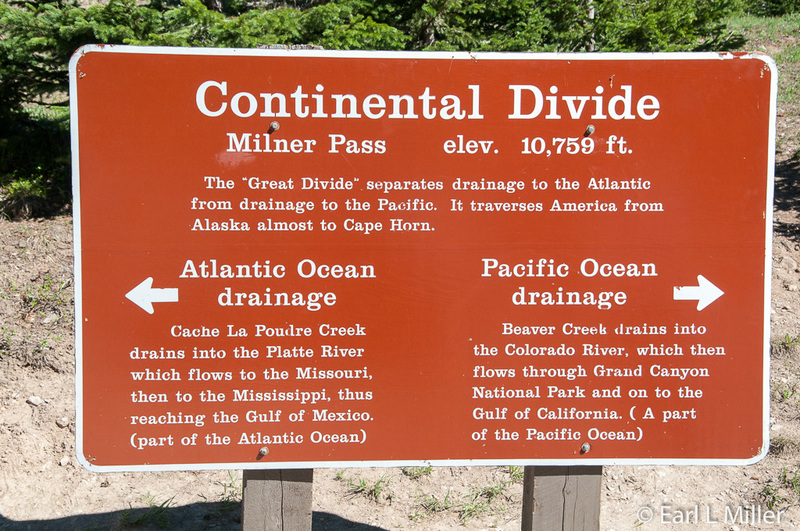 Tour stop 10, Milner Pass, is the Continental Divide. Here the location of water, by a couple of feet, will determine whether it eventually flows to the Pacific Ocean or the Atlantic Ocean. You will find the Holzwarth Historic Site at tour stop 12. In 1916, John Holzwarth Sr., a Denver saloonkeeper, decided to start over as a subsistence rancher when Prohibition arrived. He established his new homestead eight miles north of Grand Lake in 1917. He never developed the home but instead served the increasing number of mountain travelers at Holzwarth's Trout Lodge. It lasted for 10 years before conversion to a dude ranch existing for four decades. In 1973, John Holzwarth Jr. sold the property, and the park removed buildings. Rangers give tours of this property, restored to its 1920 status, between 10:00 a.m. and 4:30 p.m.. The lodge is a half mile walk from the parking lot. We found out there is a free shuttle that takes you to this site if you don’t care to walk. The guidebooks don’t mention this nor did the volunteer I talked to at one of the visitor centers. Like all national parks, rangers give talks and accompany walks from several park locations. The daily information is given in the park newspaper with nightly events listed at visitor centers. Hiking is popular with more than 350 miles of trails to explore. These range from easy to strenuous. You will find these listed in the park paper. For example, the hike around Bear Lake is a half mile. Four campgrounds for Rvs and one for tents only exist at Rocky Mountain National Park. Three out of these five were full the day we were there. For reservations at Aspenglen, Glacier Basin, and Moraine Park, call (877) 444-6777. You need a Visa or MasterCard for reservations. Park fees are $20 for a week. They do allow free admittance with national park passes. They charge $10 for hikers, bicyclists, and motorcyclists. For more information, call (970) 586-1206 or google Rocky Mountain National Park. This is the third Rocky Mountain range in the area. The first eroded 600 million years ago; the second disappeared, due to the same cause, 200 million years ago. The current range developed 30 million years ago and is currently being reduced by erosion.